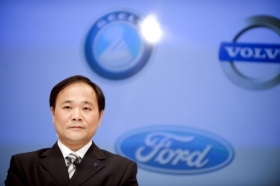 Geely President Li Shufu will give in if Volvo managers refuse to compromise because "they must have good reasons." SHANGHAI -- Three months after becoming the new owner of the Swedish car brand Volvo, Zhejiang Geely Holding Group Co. President Li Shufu said he disagrees with Volvo's management about its product plans. Speaking last week at a forum hosted by the Chinese Web site of the Financial Times in Shanghai, Li said that Volvo should develop large cars for China. But Volvo's managers prefer small cars for their fuel efficiency and environmental friendliness, according to Li. Li also disagrees with Volvo's managers about the positioning of the Volvo car brand. Li wants Volvo -- which he purchased from Ford Motor Co. for $1.7 billion (11.3 billion yuan) -- to be a luxury brand that competes with BMW and Mercedes-Benz. But Volvo's managers say their target customers are different from those of the two German luxury brands, Li said. Li said it's normal to have different opinions. He said he would keep communicating with them to narrow their differences. He also said he is willing to give in if Volvo's managers refuse to compromise their position. "Why? Because they have brought Volvo to where it is today," he said, "So, they must have good reasons (for sticking to their position)." Volvo is a minor niche brand in China, with sales of 22,700 units in the first nine months, according to J.D. Power. Only two Volvo models, the S40 and S80L, are built by a Ford joint venture in the southwest China city of Chongqing. To expand the brand, Li has announced plans to build two assembly plants and expand a third in China. He also hired Stefan Jacoby, a well-regarded former Volkswagen executive with experience in China, to run the Swedish company.